"A traditional casserole with a seafood twist! Fresh crab meat can be substituted for imitation." Preheat oven to 350 degrees F (175 degrees C). Lightly grease a 3 quart casserole dish. 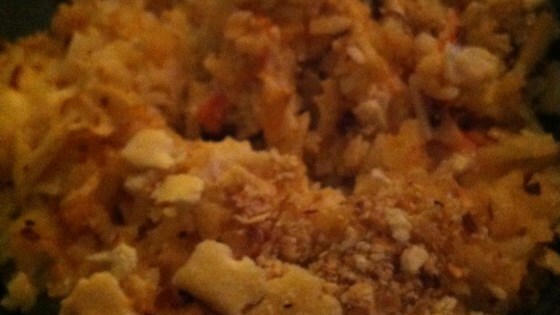 Combine crab meat, shrimp, rice, mayonnaise, onion, milk, hot sauce, and almonds in casserole dish. Mix well. Cover top of casserole with crumbled crackers. Bake, uncovered, in preheated oven for 30 to 40 minutes, or until casserole is bubbling. Unfortunately this recipe gets an ugh... The mayonnaise really over powers the whole recipe, and it feels like a mish mash of things. Sorry, wouldn't try it again nor recommend it. Hey it just needed a little red pepper, a little crushed garlic, and cut back on the milk. I added parmesan cheese with the seasoned bread crumbs. This has become a favorite recipe. Most recently I used brown instead of white rice and thought it improved both the flavor and texture; slightly nutty and more substantial. I absolutely LOVE this recipe. So does my husband. It freezes well and when heated is wonderful! Yummy!